Drain-to-Source Breakdown Voltage (VGS = 0V, ID = 250uA): 100V min. - (VGS = 5.0V, ID = 0.90A): 0.54Ω max. 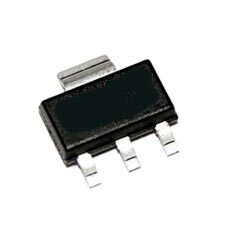 - (VGS = 4.0V, ID = 0.75A): 0.76Ω max. Forward Transconductance (VDS = 25V, ID = 0.90A): 0.57S min. Gate-to-Source Forward Leakage (VGS = 10V): 100nA max. - Total Gate Charge: 6.1nC max. - Gate-to-Source Charge: 2.6nC max. - Gate-to-Drain("Miller") Charge: 3.3nC max. Rise Time (VDD = 50V, ID = 5.6A, RG = 12Ω, RD = 8.4Ω): 47ns typ. Fall Time (VDD = 50V, ID = 5.6A, RG = 12Ω, RD = 8.4Ω): 18ns typ.